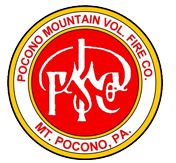 Chartered in 1925, the Pocono Mountain Volunteer Fire Company has provided fire protection to the residents, businesses and visitors of the Pocono Mountain region of Northeastern Pennsylvania for over 75 years. By looking through our website you will find information on our brave volunteers, recent fire alarms, equipment, how to become a member and how to make a donation. The Pocono Mountain Volunteer Fire Company is 100% volunteer. Members attend weekly training sessions and respond to fire and emergency calls 24 hours a day, 365 days a year. Since January 17, 1927, the Pocono Mountain Volunteer Fire Company Ladies Auxiliary has been fulfilling our objective of assisting the firemen in all things financial and social. Check your smoke detectors every week. Smoke detectors are one of the MOST important fire safety devices for the home. If the testing mechanism does not work properly, the alarm should be replaced immediately.